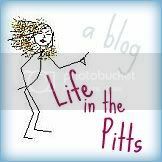 Life in the Pitts: It's not that I dont like this holiday. I cannot image and I certainly won't try to comfort you. When you have children of your own this will be a day for you and them to celebrate...until then just try a different tradition for this day, whatever it was that made you and your mother happy. Sweet and special hugs to you today. I miss my mom too and my kids are what get me through. I wish for you many wonderful Mother's Days in your future to help ease the pain of your loss. I get this feeling ever year, except it's on Father's Day. Just sending you lots of hugs, as you remember her. I actually thought of you this week and that it's nice you were around your family for it. I hope you had fun and I can understand why it would be a hard holiday for you. She must've been an amazing person cuz it wore off on you and you're pretty awesome. I feel this way on Father's Day...even though we have kids and a daddy to celebrate. It's just not ever quite the same.